The iPod Classic marks the most widespread update Apple has ever made to the ‘standard’ hard drive-based iPod range. The name’s been tweaked, the user interface given a radical overhaul, and while the new model may look like the previous version, it’s actually quite different. The iPod Classic has a metal face, not a plastic one. The shiny, curved chrome-like backplate is still there, but now it’s attached to an anodized aluminium sheet that curves gently forward before forming a flat space in which the display and clickwheel are mounted. 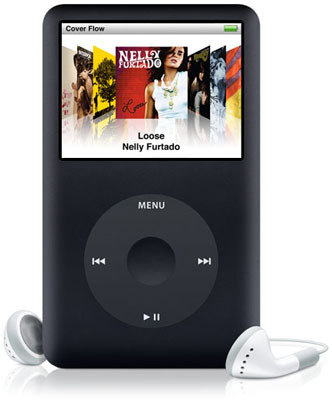 The casing – its the same material used in last year’s iPod Nano update – is tactile and has a satin sheen quite unlike the patent gloss of old. That’s good for the black Classic, which is now far more resistant to fingerprints than its predecessor was and probably more resistant to scratches, though only time will tell for sure. The back of the player however, is just as susceptible to scrapes and scratches as it always was, as we discovered when we were a little reckless in docking the device. What was once the white model is now one Apple calls ‘silver’ – but in reality it’s more of a kind of dull, pale grey. It’s not as metallic looking as last year’s Nanos and Shuffles, and it’s hard to see consumers falling for it. We’d hazard a guess that the black model will sell significantly better this coming Christmas. The metal front makes for an iPod that feels less like two halves fitted together and more like a single, solid unit. The screen and the clickwheel are slotted into holes cut in the face, and while the clickwheel has an almost perfect fit, there’s a tiny groove running around the perimeter of the screen. While it’s barely noticeable in the hand, it won’t be long before it picks up dust and pocket fluff. As before the bottom of the player is home to the dock connector, with the earphone socket and ‘hold’ switch up on top. All three are surrounded by a thin lip of colour-coded plastic to match the hue of the face plate.